Learning online is a bad way to learn guitar. Wait! ‘Is this a joke?’ I hear you say. Let me explain. Learn guitar online is bad because the information is here, there and everywhere. People share what they know too easily, too fast and often do not piece then together for the reader. Unless you enrol into a systematic course, it can get overwhelming pretty fast. In my 30 years of trying to learn to play good guitar, I’ve found out that its too easy to get sidelined and distracted. Even more now than before because of information clutter that can be so easily obtained online. Here’s 4 key plan that you always need to have with you. And you can find all of these (except the last one) online. Then learn how these chord feels. Learn the scales of the key to a song. Know where is 1, 2, 3, 4, 5, 6 and 7th note of the scale of the song you are playing. Know what’s a major, minor and dominant scale. Just the basic ones first. You can learn the complicated scales which is derived from the basic ones. Yes the internet distracts and overload us with information but often it also makes learning fun. Much around online but at the end of the day, its not just the notes that matter in playing, its the feel. The feel is found in the groove. Develop your groove by listening to the original songs (oh ya online). You can also work on your groove offline. Without the internet or your instrument. Tap to the song you are learning in your head. The groove is really what makes a song flow. A flowing song connects hearts of people. Without it, you may just not have the song. It’s that important. These are the 4 things to have as a plan when learning to play guitar. Have a question? Just drop me a line and we’ll see where the conversation goes to. Enjoy! This entry was posted in Blog, Making Good Music, Teaching Yourself on April 26, 2018 by HT. One of the unique services I provide with my social enterprise is to hand deliver my products to my customers. Today I a guy bought a looper from me. He enlisted in our National Service (NS) as an army personal. He’ll be coming out of the enlistment in a month’s time and then have 7 months before going to university. So the topic of our discussion in the brief time we are connected is, what can he do with music in his 7 months spare time. Here are some of the points we discussed which I thought will make a good post. I added a few more after that, considering what if I would personally do if I had that 7 months. This is what that customer did and he’s on the right track to spend the 7 months working on his groove. I written enough about why a guitar looper is the most important pedal and how it improves your rhythm like nothing else so check out the links for more details. 7 months is good time to not just improve but have a quantum leap in how you play. The best way to big improvement is to get a teacher. You may have a teacher you admire or a player you like very much. Go and act on asking them if they will teach you. Alternatively get into an online course that is effective. A lot of courses today allow you to submit your playing for critic and guidance by the teacher. Check out courses by Artistworks.com. My time with them learning from Martin Taylor’s FingerStyle Guitar and Keith Wyatt Blues Guitar has been most effective and memorable learning time in my playing history. If you are a bedroom or closet player, a long break maybe a good time to bring your playing to a new level playing with others. And if you have already been doing that to form a band and get serious with your music. One of the joys of playing the guitar is playing with other people. Maybe your time practising and playing with yourself is coming to an end. It’s time for playing with others and becoming more serious about your music beginning. I have been a bedroom musician most of my life and its only recently that I started to get together with a group of people to jam. Before you do so, maybe you should read the account of how I survive my first jam session. Give it a go to write songs. If you are new to it, it’s a good time to invest in learning how to do it. It doesn’t have to be difficult if you allow yourself to flow with the music that is already in you. If you already have enough songs that can make an album, instead of writing, get it recorded. 7 months to get into recording, producing and maybe even selling your album is worth the time. And today’s music technology to setup a home studio and your own music and selling it is more than adequate and available. Start An Online Business Marketing Musical Products You Love. Maybe playing is not the way you choose, if you are entrepreneural and just want to get into the business side of music, consider starting an online business using a website to do affiliate marketting. Affiliate marketting basically is about getting a commission to promote products that you like without needing to own the stocks. You point your buyers to affiliate partners like Amazon, Guitar Centre and Musican Friend and when they make a sell, you get the commision. One of the challenges of online business is time it takes to build a traffic and if you have 7 months dedicated to do it, it will be excellent as not many people have that. You can start one easily with programs that teaches you how to do it. I have a website called Easyonlinebusiness Club to help you with this with all the research I put into finding the right products you need to get started. Start a music website just like this one. Click below to find out how I did it. Well above are 5 things I recommend that you do with your 7 months spare time. Of course these recommendation will be different if the duration is shorter or longer for 7 months, you can make meaningful musical journey. So what will you do if you have 7 months of break? Let us know by giving me your comments below. I love to hear your adventures. This entry was posted in Blog, Connect To Yourself, Teaching Yourself on July 12, 2017 by HT. Playing the guitar is itself a great goal. Not many people consider it in a practical world where survival seems to be the primary concern. But just wanting to play well is only the first step, it is important to be clear about what you are trying to achieve specifically. How to improve your guitar playing is as good as the goals you set for yourself. Here are 6 ways you can improve by setting the right goals. Having a goal to play to impress someone or to feel good easily fizzes out. I remember the group of friends I have when I was younger. Half of them plays because it is a cool thing to do. Besides the guitar, they go for the look, the other half truly love music and play for enjoyment. The latter group is still playing today. Beyond your ‘rock star’ intention, enjoy it. Set a goal based on enjoyment. Get into the type of music you want to play. Listen to the music, buy the music, attend the concert and invest in it. A great tip is this phrase that I sue “Get into the rhythm and beat of what you want to play”. In that phrase is the key to enjoyment because every piece of music has life and it is my humble opinion in the inner rhythm of the music. Your goal is not what you want to play but how often you do it. This comes with if you have a conducive place to play. Setting up your own practice space is the #1 reason I play often. After finding a good space to play, then commit to a routine that helps you play often. It is better to play regularly for shorter time than irregularly for longer time. A good routine is as such “Every morning for 10 minutes”, “Every alternate day for 20 minutes”, Have a weekly schedule of when you’ll play and really get down to it. Having that settled, then look into what you play and have a note-book to journal and record what you play during the sessions you are playing. This is one of the worst practising habit I developed when I was younger. I would come into practice with a great song I want to play. Then during the practice, I will get discouraged because I couldn’t play it in that one practice session and the next time I play, I come with a different song. The remedy to this is to break that one big goal of playing that song to smaller ones. One way to work on songs is to listen to the song first and get into the rhythm of it. Then get the chord sequence right. Only after that should you sing or learn the melody (if you are playing fingerstyle). After that, there’ll be difficult parts you should handle at a latter time. All the above happens in many sessions, not one. I don’t know why I have bought into the idea that you can master a song in one sitting and that has hurt me and I’m glad to share with you the mistake of not breaking my big goals into smaller ones. Don’t we all fall into loving techniques and riff. Isn’t it more appealing to tap, pull off, bend and do all those sweeping and shredding. Yes, it maybe more fun to do so but I suggest getting into songs. Set the right goal of playing songs where these techniques and riffs are incorporated into the song than the techniques itself without the context of a song. When you set the right goal of songs, you invest in your music. Nobody is going to be listening to you play your riffs just by itself. Everybody wants to hear how you play a particular song. So get clear to invest in songs. Your goal isn’t to be an imitation but to be yourself. There is room to imitate but at the end of the day, you should develop your style and be yourself. So don’t be frustrated if you can’t sound exactly like your heroes. They are there to inspire you to be yourself. It is infact, the very reason why you like your hero. They are themselves and not a clone of someone else. So develop a liking for yourself and who you are musically and what you can offer to the world. Set the right goal of being yourself and not a second-rate of someone else. As you learn songs of other people, you will figure out melody, harmony, chord sequences and song structures. That is important to eventually do play your own music ie. write your own songs. But before that can happen, you should invest in improvisation. By that I mean having the ability to come out with tunes without thinking. Improvisation depends on your hearing and your feel to get the music you have inside of you out. Set a goal to improvise either through using a backing track or a looper. It will help you develop your musicality and that is a key component to your goal as a great guitar player. Enjoy. Do let me know how do you improve your guitar playing? What type of goals do you set for yourself? This entry was posted in Blog, Connect To Yourself, Teaching Yourself on June 17, 2017 by HT. You want to teach yourself to play the guitar. That’s great. Many people do. But not many people succeed. That is because learning the guitar is a steep slope and they don’t start with a strategy. Without a strategy, we always quit when the going gets tough. Here are 3 ways to teach yourself to play the guitar. Sorry, watching Youtube is not a one of them. Well, at least not without a system. You have to keep on learning to play one whole song. To learn one song well is better than many songs in parts. One has a clear outcome, the other really nothing to show but us attempting to show off. And believe me, very few people are impressed by our fancy intros or licks in the middle and a dramatic end. When we can’t even play a full song from start until one, people will think we are an impostor. And seriously we are. One of the reasons why we don’t learn one song from start to end is because we are not clear about how to choose that song. That song has to be a personal song, one that speaks to you and when spoken or sung represent you. A good way is to ask yourself if the words or melody represent what you want to share to the world. Pick a good song. The right song and stick to learning one song on your own. A great strategy is then STEP 1, to learn the chord progression first. Then STEP 2 to learn the melody. If you don’t know the melody well enough, listen to many versions of the same song on Youtube. And lastly STEP 3 is to learn to play the chord progression while singing out the melody or the song. Having learned one song, you can firmly say that you have taught yourself to play the guitar. 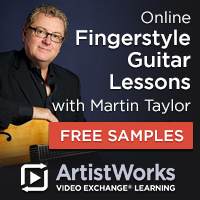 Blues Guitar Lessons With Keith Wyatt. Andreas Oberg’s Jazz Guitar and More. David Reed’s Improvise for Real. The choice depends on the genre of music you are into and what you are trying to learn. Go seeks out a basic course that will teach you how to start playing the guitar. Yes, getting an online teacher is not cheating, it is a great way to teach yourself to play the guitar. This strategy has to do with finding an outline of what you should know in order to learn to play. An outline can come from searching for one on the internet to copying the index of a book or just posing the question “What are the important things to cover when learning the guitar?” on a forum. With that outline, go and be an independent learner to find out how to educate yourself point by point. Go ask a friend, join a forum and pose a “how do I …” question. Learn from the vast information available on Youtube on your own. A sample outline that serves as a checklist on how to play is as follows. The above will serve as a checklist for you to explore the areas of playing the guitar more systematically than to randomly select a guitar lesson online. I have to admit that Youtube is truly a wealth of resource. But I should add that only if you use it systematically and I suggest the above 3 ways of systematically teaching yourself how to play the guitar. Of course getting a teacher is always the best way but if cost is a consideration or you are the kind of independent learner like myself, the 3 ways are more adventurous and a more fun way to go. What do you think? How did you teach yourself to play the guitar? Please write a comment below. I really like to hear from you. 16 Comments - Share Yours? This entry was posted in Blog, Teaching Yourself on May 2, 2017 by HT.